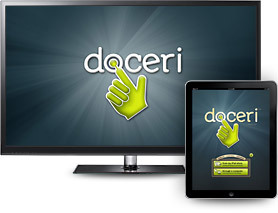 When you’re not able to connect to your Windows PC or Mac via Doceri desktop, you can still present your Doceri projects via Airplay. Doceri's Dual Presenter View for Airplay means that while you’ll see all the Doceri authoring and presentation controls on your iPad, your audience will only see what appears in the audience viewing window. Turning your iPad to a vertical position will give you both your control view, and the audience view. The Doceri Custom in-app purchase provides you the option to remove the “Created with Doceri” watermark, or add a custom logo or hand-drawn watermark that you create within Doceri.